A little price run down. When and what country are those prices from? I have a 1995 wholesale price list and the prices in your list are less than the wholesale prices. I would really appreciate more FRN colours. I'm all for it. But don't make it an exclusive only available from one dealer, limited release at midnight on one day etc etc. I would like to see some other colors too. The Dragonfly can be colour matched to clothing easily if we had a bigger range. I carry a serrated 440V Military and would love to buy a new model if it is in a stainless steel. No thank you. ZDP is working just fine. Topic: Old Spyderco Advertising in Magazine ! 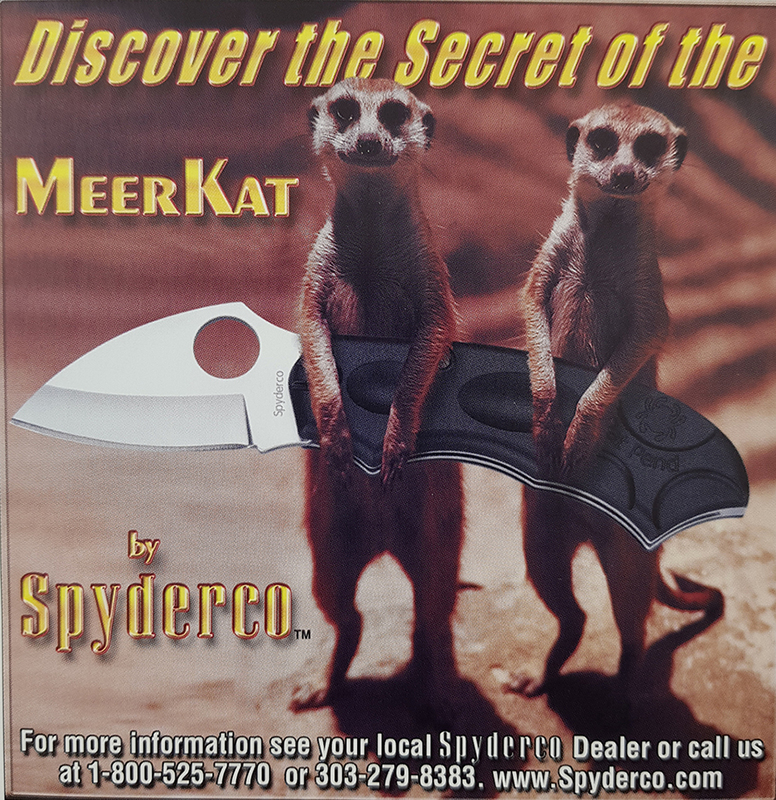 Re: Old Spyderco Advertising in Magazine ! This is a fantastic one. I bought 8 as part of a collection and sold them all. When i first heard about the Paramilitary I was excited until the compression lock. I managed to get a photo done quicker than I thought. Here are some new stickers I have been lucky to obtain. The Seconds sale sticker was a gift from a forums member here, all the way to Australia. Later today I will try and get a photo of the whole collection together. I have some new ones I will have to do a photo. Spyderco are wonderful knives but not every knife is liked by everyone. So some get sold. Collectors treat them like this even if they are part of the collectors club. Topic: Spyderco Kiwi: What would you like to see if remade? Re: Spyderco Kiwi: What would you like to see if remade? Topic: Are we already feeling the effects? Re: Are we already feeling the effects? How about a new range of hummingbirds.